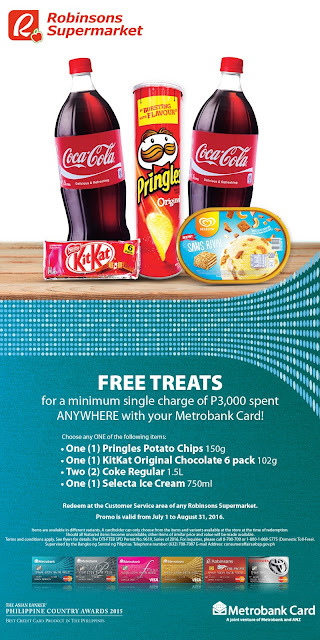 FREE Robinsons Supermarket Treats w/ Metrobank ~ Philippine Freebies, Promos, Contests and MORE! It's time to enjoy swiping your Metrobank credit card and get FREE Robinsons Supermarket Treats in return. A minimum spend worth P3,000 gives you a choice of one (1) Pringles Potato Chips (150g), one (1) KITKAT Original Chocolate 6 pack (102g), two (2) Coke Regular bottles (1.5L each), and one (1) Selecta ice cream (750ml). Enjoy up to 2 redemptions per store visit per day. Simply present your card and surrender your charge slip transaction at the Customer Service area of any Robinsons Supermarket branch to get your freebie. By the way, item availability may vary per Robinsons Supermarket branch. But in case an item is not available at the time of redemption, you may select from the other featured items available.